Despite the weather warnings, I was still surprised to see snow on the ground when I reached Watford, having seen none on leaving London. I’m told there had been quite the snow storm in the morning but, thankfully, by lunchtime, the sun was out and the little snow that had settled was already melting. In fact, having wrapped myself up for icy conditions, it felt positively mild and I was shedding layers as I walked to the West Herts. There was much pre-match talk of the horror show at Huddersfield and annoyance that a team with such a wealth of talent could put in such an abject performance. Team news was that there were three changes from that game with Anya, Paredes and Ighalo coming in for Abdi, Pudil and Vydra. The starting line-up was Gomes, Angella, Cathcart, Hoban, Anya, Munari, Tözsér, Layún, Paredes, Ighalo and Deeney. I must say that only the inclusion of Ighalo was welcomed. Certainly, the absence of Abdi was much lamented and there was some discussion of the formation until Layún lined up for kick-off in the midfield three. Watford started brightly and had an early shot on goal as Ighalo connected with a cross from Tözsér but headed wide. Deeney played a through ball for Anya, but the Scot was pulled back by Solly who picked up a very early card for the offence. In the next move, Anya broke down the left and found Ighalo, who did well to wriggle past the defender on the byline and get in a cross for Deeney whose shot was blocked by the keeper. From Tözsér’s corner, Angella’s header was blocked by Etheridge and Munari’s follow-up was headed off the line. Charlton had a moment’s respite when Vetokele broke forward and passed to Gudmundsson whose shot was blocked by Gomes. When you have a number of early chances and fail to score there is that horrible feeling in the back of your mind that it is not going to be your day. Thankfully, that feeling was quickly dispelled as Watford made the breakthrough in the 14th minute. 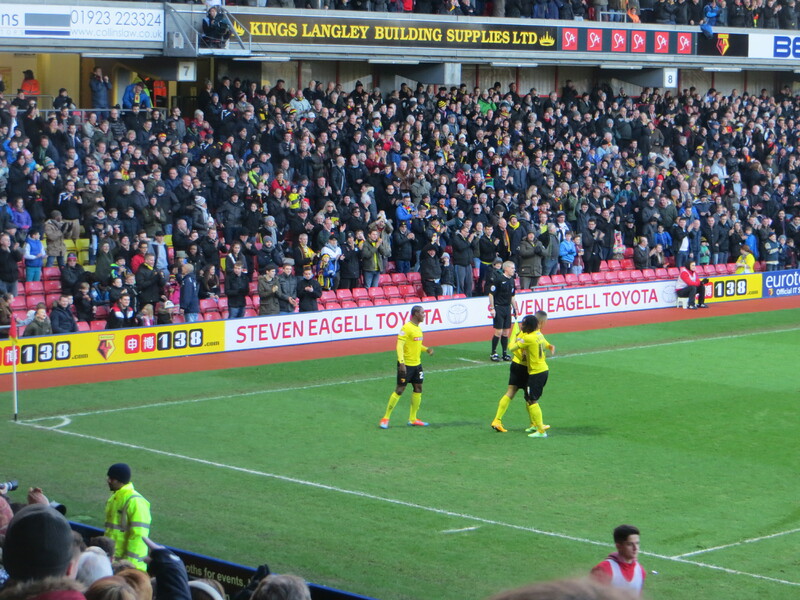 From a corner, the ball came out to Layún whose cross was knocked on by Ighalo to Cathcart who fired past Etheridge. Layún was the next to try his luck with a shot from distance that was blocked by the keeper. Watford had to make an early substitution as an injury forced Munari off to be replaced by Pudil. The change meant that Anya joined Layún and Tozser in the central midfield three. This was interesting, if rather scary. Watford’s second goal came soon after as a lovely ball over the top from Angella reached Deeney who shrugged off the attentions of Bikey before burying the ball. Soon after, Etheridge did well to tip a shot from Ighalo around the post. Then Paredes found Ighalo in the box, the Nigerian had both the ball and his feet taken away from him, but appeals for a penalty were waved away. On the half hour, a Tözsér corner was headed just over the bar by Angella. Watford continued to attack as Paredes broke down the right and unleashed a shot that flew just wide of the near post. Charlton briefly threatened as Harriott found Gudmundsson in a dangerous position but, thankfully, he couldn’t control the ball and it went out for a goal kick. Pudil played the ball in to Ighalo, who was in the clear, but shot straight at the keeper. Watford got their third goal just before half-time as Layún found Paredes on the right, he advanced to the byline before cutting the ball back to Ighalo who knocked it past Etheridge. 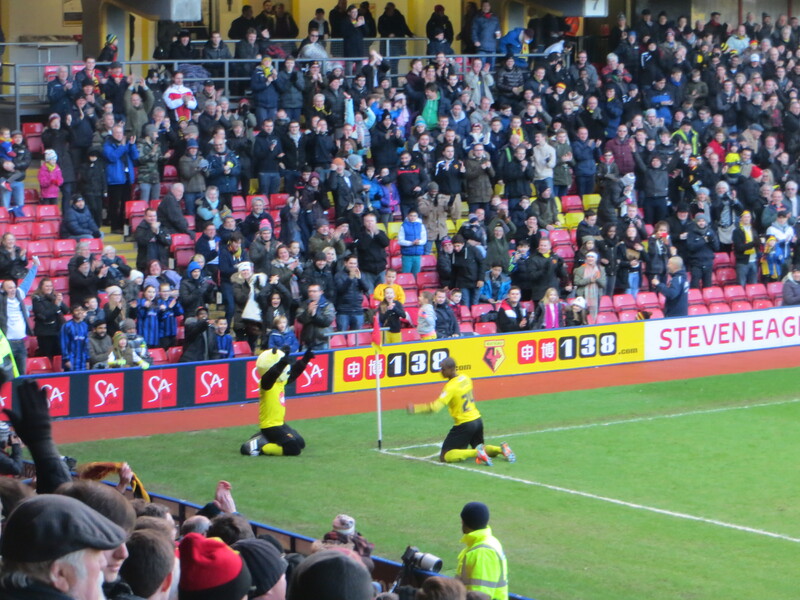 The goal was no more than Ighalo deserved after his great first half showing and he ran to the corner flag in front of the 1881 and celebrated with Harry Hornet. Watford started the second half on the attack as a lovely passing move finished with Anya playing the ball back to Deeney whose shot was pushed wide of the far post. For the visitors, Gudmundsson tried to find Cousins in the box, but Gomes was first to the ball. Just before the hour, Ighalo scored his second and Watford’s fourth heading home a Tözsér corner. A rare attack from Charlton finished with a looping shot straight at Gomes. At this point, Harry Hornet started a Mexican wave which made its way around the stadium twice before petering out. Welcome to Vicarage Road, Miguel Layún. Another ball into the Watford box was headed wide by Bikey under a challenge from Angella. At the other end, a shot from Tözsér flew just over the bar. 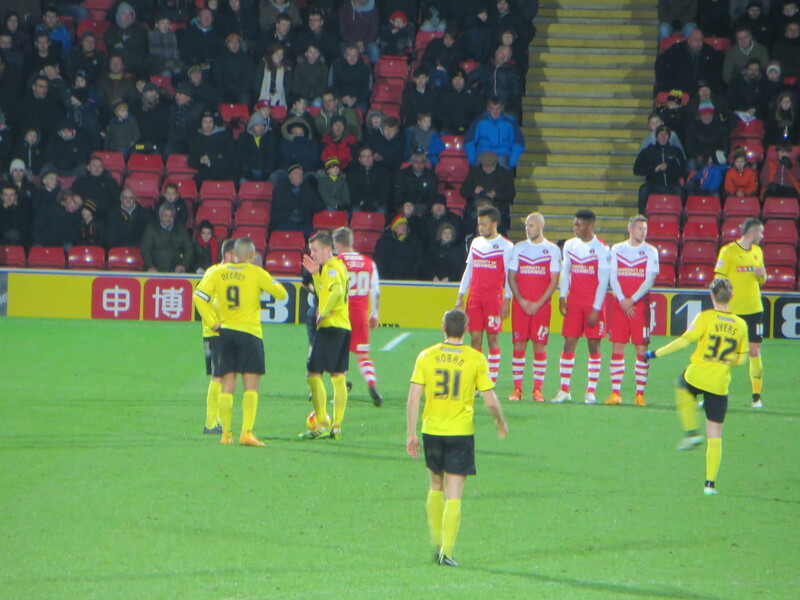 Deeney then exchanged passes with Ighalo before curling a lovely shot that Etheridge did really well to push clear. Ighalo wasn’t to get his hat trick as he was replaced by Vydra on 74 minutes. He left the field to a standing ovation. 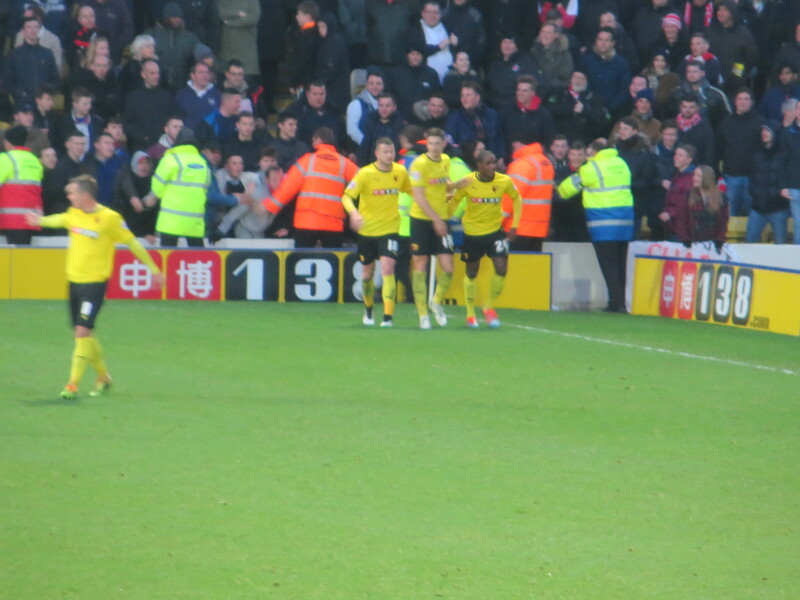 Deeney skipped past a couple of defenders, but his final ball was too far in front of Vydra. Then Watford had a bizarre chance as Anya dinked the ball goalwards, it hit a defender and appeared to be going in with Etheridge stranded, but was spinning and bounced off the line and out. With 9 minutes remaining, Anya made way for George Byers, who was making his first team debut. The youngster was soon in the thick of the action and just as my sister smilingly noted his maiden foul in Championship football, the 1881 started a chant of “knocked down by a twelve year old”. Watford were still looking to increase their lead as a chip from Deeney was gathered by the keeper. Then Pudil hit a shot from the left which flew wide of the far post. 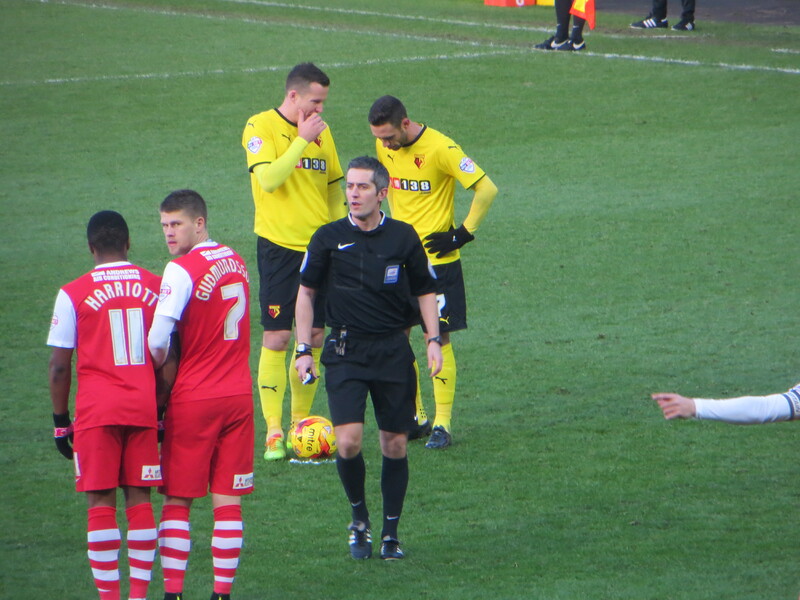 In time added on, Bikey was booked for a foul on Vydra. Layún and Tözsér were both on hand to take the free-kick, but it was the Hungarian who stepped up and blasted it into the far corner for Watford’s fifth goal of the afternoon. What a difference a week makes. The players did a lap of the pitch taking very well deserved plaudits from all sides of the ground. Layun’s home debut had been rather good and his inter-passing with Paredes was a big factor in the Ecuadorian’s best performance for some time. George Byers had a tidy debut that bodes well for his future. Ighalo thoroughly deserved his man of the match award although a special mention should also go to Tözsér for an assured performance in the centre capped by a goal and an assist. It has to be said that Charlton were appalling and gave us the space to play, but we took full advantage. We now need to start standing up to teams that look to nullify our midfield. If we can only do that, the rest of the season will be a lot of fun. This entry was posted in Watford FC and tagged Andre Bikey, Callum Harriott, Charlton Athletic FC, Chris Solly, Craig Cathcart, Daniel Pudil, Daniel Tozser, Gabriele Angella, George Byers, Gianni Munari, Heurelho Gomes, Igor Vetokele, Ikechi Anya, Joe Gomez, Johann Berg Gudmundsson, Jordan Cousins, Juan Carlos Paredes, Lawrie Wilson, Matej Vydra, Miguel Layun, Neil Etheridge, Odion Ighalo, Rhoys Wiggins, Simon Church, Slavisa Jokanovic, Tal Ben Haim, Tommie Hoban, Tony Watt, Troy Deeney, Watford FC, Yoni Buyens on January 18, 2015 by franelynn.